Almost three decades ago this young pup was called upon to clean some windows. An idea blossomed to do my cleaning the way professionals do theirs – with professional-quality implements and techniques. Storefront windows are large expanses of glass. A large squeegee was wanted. Within a dedicated commercial cleaning supplies company, choices were examined. Brass components seemed best. I chose an 18″ model which looked fully serviceable. Sleek, elegant, well-balanced. Excellent duty this squeegee did. After proper scrubbing a streak-free glass surface was obtained. Eventually I left the storefront. The squeegee tagged along, to be rediscovered years later. A glass shower enclosure wanted a professionally cleaned look. The squeegee worked before, so I tried it again. Time had not been kind to the rubber insert. Back to the same supply company, where they sold insert by the foot. Not knowing any better, I took what they sold. Which was ill-fitting, poorly formulated, immediately left streaks, and quickly began leaving black smudges. Lets be clear. The OEM insert lasted years of light use and performed perfectly. The replacement never gave satisfaction. Research was in order. 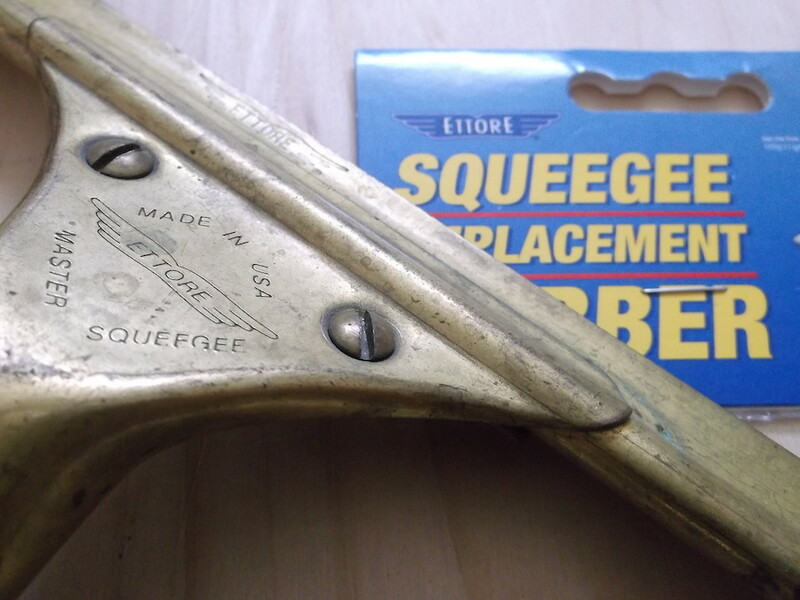 Originally purchased was the Cadillac of squeegees, an Ettore, produced by the leader in such products. An American Dream story of manufacturing. Immigrant has invention then is spurned by manufacturers and vendors. Immigrant markets invention, becomes successful, dominates the market long after patent runs out. Initially balance and design won converts. But the streak-free glass … what was that about? The secret rubber formula of the squeegee insert! Back to OEM I go. For about the SAME cost as a cheap import squeegee insert, I buy a genuine Ettore insert. My 18″ Ettore is back to full function. A perfect product. This entry was posted in Product Review and tagged ettore squeegee insert.